We all know each and every site, especially social and internet search engine sites are interested in what we do on the internet. They claim that this data is to offer you more content specific ads that will interest you. Your online browsing activities like the websites you visit and your search queries are collected by a variety of third parties that also include Facebook, Google, Yahoo, Digg, Twitter and the list goes on. The data is used by marketing and media companies for research and to provide content specific ads. However there are ways to block these third party trackers from getting your information and you do this at the browser. There is one browser extension that will let you block a variety of trackers. The extension is called Disconnect, which is appropriately named is a browser extension for Chrome browser and was developed by ex-Googler Brian Kennish. The browser extension has a variety of features loaded in it. It disables third party tracking from sites like Digg, Facebook, Twitter, Google and Yahoo without affecting any usability of these sites. It also removes search personalization features from Google, Yahoo and other search engines. It also gives you a stat on how many cookie and resource requests were blocked. You can however at will unblock services whenever required in order to access certain applications. Disconnect installs easy and an icon to the top right of the browser window shows the stats. You can disable it by right-clicking that icon. 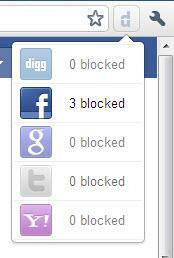 You can selectively block or unblock a service to one or all the websites. You can get Disconnect from the Google Chrome Gallery which can be reached here.